Hello! I’m quite often to be found on the HC (Help Chat, for those of you who don’t visit very often), and one of the most common questions asked there is from people wanting to make Neopoints. Generally for whatever reason their computer is too slow to restock, can’t load games, and stocks are too confusing to master. So I was trying to think of other ways to make Neopoints, and chanced upon the Trading Post. The Trading Post (TP) is often neglected as a NP-making opportunity, so I decided to test whether someone could potentially make a decent lifestyle for their pets using it alone. I called my experiment the Trading Game; the idea is that you start with a worthless object and try to trade it for something slightly more valuable, which you trade again and again, getting better items each time. Eventually, with a lot of effort but no NP spent, you end up with an expensive object. This was my plan. I had a few rules for myself. Firstly, no-one was going to know what I was doing. They would accept or reject my offer based on whether they wanted it or not – I was not going to communicate with the sellers at all. Also I was not going to offer junk items for expensive ones; that’s not the point (plus it’s incredibly annoying to the other traders) - the idea is that each step is slight, and both people get a good deal. Finally, I was to be the one searching for offers – I would scan the most recent trades with each item and choose my targets. I spent a single neopoint on my project, and picked up one of the cheapest and most annoying objects in Neopia. A Pile of Dung. And after the initial investment on 1 NP I was ready to begin. It turns out that trading dung for even another 1 NP item is difficult, because of the stigma attached to this (wearable) object. But I persevered, and after being turned down for an omelette (alright, a bit of a stretch, but I was optimistic...) I managed to exchange it for a Reject Flower Shaped Sand (value 1 NP). Fabulous! Still a cheap object, but with much more buying power. The next trade was easy, the wishlist for a Mummified Pepper sounded slightly desperate (“Please, take it away!” or something similar), so I bid my sand, and it was accepted immediately! I was now in possession of a useful food item! Already I could make a profit of 7 NP. Things were going well. After being rejected for several objects, including a few cheap stamps and suchlike, I managed to trade for a Neopian Times Issue 3. Still considered a junk item, at least this can be read to pets, and therefore has some use. For the first time, I was rejecting items because they were too cheap! I bypassed Toy Sail Boats and Rockfish in search of something more expensive... It’s a bit difficult because so many trades consist of more than one item. I never made any rules about whether I was allowed to trade one item for multiple; I thought I’d cross that bridge if I ever came to it! It was taking a while, but I was trying to trade a book now (admittedly one of the cheapest books...) and surely that would bring on some trades. I got rejections from a cheap stamp, a Bat Cookie and an omelette (I was trying again) and I was starting to wonder if I’d made a mistake. Maybe the NT3 was a bit too “junky” to be traded? So I bid on a Salt Mote in the hope that, if I got it, the cute little face would be accepted more easily. I won the bid, and now I was in possession of the Mote. So, four trades later and I could have a potential profit of 19 NP. Not bad, but most Neopians probably get more than that in bank interest just for clicking a button. More trading is required! It proved a lot harder to get rid of the Salt Mote than I thought – apparently cute little faces on items don’t count for as much as they should! I targeted books and food mainly, because most other items people will wish to sell, and therefore look for profit. But books and food can be used easily, and people may buy them for less. I was looking for easy-to-sell items and eventually I found one. It was another trade with a slightly desperate wishlist, and in it was a book called The Snow Aisha Adventure. Due to either a very generous or a very desperate seller, my bid was accepted and I had managed to jump about 6 times the price of my item! Plus this was a book, so hopefully it would sell easily. Now I had definitely advanced out of the “junk item” stage, and hopefully my potential profits would rise now I was over the 100 NP mark. But only another trade attempt would tell me that. Another major jump! I bid on an Altachuck (420 NP) and got accepted! If you’re wondering why, it could be because these are given out by the Altador Plot daily quite often, so I bid in the hope that the seller had received it free and wasn’t expecting a major profit. Now I have a petpet! What’s the next step? I managed to bid for a trading card called Spectral Elemental, worth about 700 NP. The problem is that trading cards aren’t exactly easy to sell, so my plan is to bid for something worth a bit less, to ensure success. Well... that was my plan, but when someone put up a Scarab Ring for 950 NP, how could I resist not trying for it? And no-one else must have made an offer, because soon the ring was in my inventory. I’d passed the 1000 NP mark! My future was bright. But now was a hard value to increase – below the dubloon/codestone values to come, but above the junk items below. The Ring took me a really long time to sell. I was rejected from a lot of offers (but luckily, after so many trades, I’m quite used to rejection!). My aim was a Negg, so I kept bidding on them, and eventually someone accepted. So now I have a plain Negg which is hopefully easy to sell! Surprisingly, this was harder than I thought. I couldn’t bid on any neggs, because who would want a basic one in return for another? And codestones were out of reach still. I was really looking for petpets, but for some reason all the sellers want pure today. So I eventually managed to be accepted for a hard to sell item, a Gnome Pencil which someone wanted to get rid of cheaply. There weren’t that many on the shop wiz, and the prices were anything from 2.5k to 88k – a sure sign of something no-one wants to buy. But perhaps I could get another item of equal value for it. It took a while. After a bit I was ready to bid on a Negg and hopefully get accepted and move back a step. I figured out that when people see “pencil” in the offer, they reject. “Pencil” is not a word which conjures up the image of wealth. Oops. I had that pencil sitting in my inventory for hours. But eventually, and to my delight, I managed to be accepted for a Main Codestone. Should I stop now? I had proved that someone could start with a bit of dung and end up with a sought-after item. No. I wanted to see how far this could go. I very quickly managed to trade for a Mau Codestone, not a big jump, but the price difference is more than my first 5 trades value put together, so I’m not complaining! I kept up the codestone theme and managed to grab a Zei Codestone (4.9k NP). Wow. Almost into the 5,000 NP range. I made a decision on the “one or more item” rule by bidding and getting accepted for a two-item trade. A Negg and a Purple Negg. I find this quite interesting, as I only had a Negg a few trades back, making my profit in four trades a purple Negg. Not bad, eh? The seller was selling it really cheap, so I managed to get this item easily. It’s a book, so will hopefully sell quite well. Plus I’m back to one item, which is nice! Just saw my Gnome Pencil in trades! I recognized the person I traded it with. Weird. It’s taking a long time to trade the book – maybe people have bad memories from maths? After hours of trying to trade a maths book, I would have almost happily accepted a Pile of Dung for it, but I was patient and held out, clenching my teeth the whole time. And it paid off. I managed to grab three Neggs, worth about the same as the book, but more recognizable. Three ETS items for one HTS one. But at least it’s retired, and worth a bit more than the Neggs. Not too hard to trade a plushie for a plushie! And quite a cute one at that...! I should probably give a bit more of an explanation for this trade! For a start, these trades took place over several weeks, when I had time and energy to experiment with them. In some cases, if you check the prices of items now, they may be quite different due to recent supply and demand. In this case, the plushie has risen in price by about 5k NP total. The wishlist for the Soda sounded pretty anxious to get rid of them; they’re quite hard to sell. But I’m optimistic I can get a good item for them both, as some traders could probably manage to sell them for a higher value. Good memories... or maybe not. But it hopefully is an item in demand, at least among fans of Green Unis... Now if I wanted, I could morph one of my pets! But I’ve decided to stop here and write everything down. 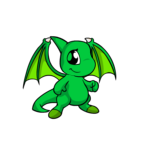 It was a lot of fun, this whole Trading Game, but I decided to end it and get on with my other Neopets activities. So I put up my own trade with the Morphing Potion in it, and asked for 10k and a Pile of Dung, which I eventually got, making my total profit 10,000 NP from this activity. Could I have carried on? Certainly! And maybe you want to try to get a Paint Brush from a Pile of Dung, or something more expensive! If anyone manages to get all the way up to a Super Attack Pea, be sure to let me know...! So there we have it – profit from junk. It wasn’t the quickest, easiest or best way to get 10k, by almost any stretch of the imagination, but it’s possible to earn without spending a single NP. If you decide to try this out, you need a lot of patience, but I wish you Good Luck and Happy Trading! Thanks for reading, and good luck with trading! I welcome any Neomail with comments or questions. This is meant to be a guide for bumping you up to the advanced level of Key Quest.